This archive holds all posts form February 1, 2014. In a rare move, the Google Doodle today features a black woman, Harriet Tubman, to mark the start of Black History Month. Earlier this year when they honored the great American author and anthropologist Zora Neal Hurston with an illustration. Where do the doodles come from? The first Google doodle appeared in 1998, when Brin and Page decided to leave the company untended for a couple of days while they attended the Burning Man festival in the Nevada desert. Brin put a little stick figure emblematic of the event on the Google logo as a clue to where they were. Users loved it, and soon the company hired an outside graphic artist to come up with other simple cartoons to mark special events. Hwang’s original job involved straightforward programming chores, but soon he was charged with posting those doodles and “cleaning them up,” in programming parlance, so they looked better. After his modification of a Fourth of July doodle caught the founders’ attention, word of Hwang’s art experience and his talent got around. Pretty soon, Hwang became the official doodler, completing about 50 doodles a year. About once a quarter, a group of executives get together to map out a calendar of doodle-worthy dates. Page and Brin have the final say, and they sometimes approve spontaneous drawings, such as when a Mars Rover landed. Hwang creates the images, using an electronic tablet and stylus for his sketches. The doodles are fun, usually whimsical—and sometimes baffling. Know about Gaston Julia, for example? Visitors to Google on February 3, 2004, saw the Google logo with a hurricane-shaped “o” against a backdrop of equations to celebrate the French mathematician’s birthday. The Doodles then, offer a kind of insight the values of the executives at Google, one of the key shapers of Internet culture. Some enterprising young graduate student could do a mighty fine dissertation offering an analysis of all the Google Doodles ever published for what these tell us about Google, Internet culture, and American society. The algorithms that Google’s News page uses also rely on the size and perceived readership of the sites it features, along with the number of articles it puts out a day, along with other factors, to decide which stories to promote and which to ignore. In the case of Google Doodles, we can see the emergence of a symbiotic relationship: Google’s choice of a person or topic gives newspapers an easy topic to cover with guaranteed interest from a key source of traffic, keeping them near the top of the News rankings for other topics; while Google gets traffic to its services from people made aware of its cute little commemorative cartoon or game. Google, then, creates the news (or at least some news), and has the ability to raise awareness about niche topics or person who are perhaps not particularly well catered for by the media most of the time. Google has a real power to raise awareness about the many lesser known heroes of American culture, many of whom are black women, and other people of color. 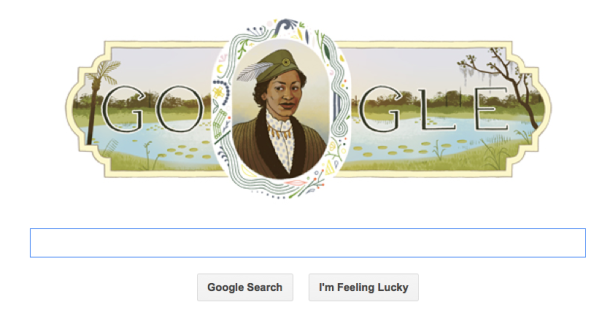 The Doodles of Tubman and Hurston may be just two isolated disruptions in the otherwise all male, mostly white pantheon of those deemed worthy of an illustration from the Internet giant Google. Or, it could be the start of a trend in the right direction. Only time, and the next Doodle, will tell.